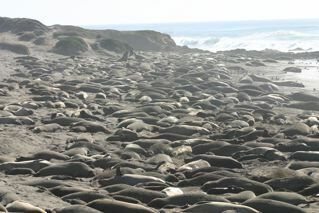 A BUBBLING CAULDRON: It's Elephant Seal Viewing Time Again! A VERY SPECIAL PLACE - AND CLOSE, TOO Once again I'll remind you of a very special experience that awaits you just 275 miles north, along the California Central Coast. FIVE EASY DRIVING HOURS About 4.5 miles north of Hearst Castle on California Highway 1(about 50 miles north of San Luis Obispo) and just south of the Piedras Blancas lighthouse, is the winter breeding grounds of the largest and fastest growing colony of Northern Elephant Seals in the world! I wrote about it for you three years ago, HERE. The only thing that has changed since that time is that the colony has gotten larger and the viewing is much easier. LOTS OF PUPS BEING BORN After fairly stable birth rates - around 4,000 per year for the three previous years - last year 4,500 pups were born at the Piedras Blancas colony! The first pups are typically born December 15th but this year the first reported birth was on the 10th and the pups are now popping out like Pez. This time of year it's very likely that you'll see births happening as you stand only a few yards away. BIG GUYS FIGHTING You'll also see large males - 5,000 pounds in some cases - fighting for the privilege of mating with the ladies on the beach. The most dominant males may have harems of up to 50 females and must constantly be on the alert to protect them from interlopers. 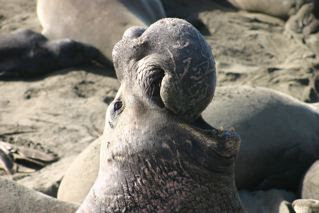 EXCELLENT PARKING AND EASY VIEWING There are two large parking lots along Highway 1 created specifically for Elephant Seal viewing. At the south end there is a boardwalk that places you practically in the midst of the thousands of seals present at this time of year. At the north end of the southern lot is a brand new trail which takes you to the northern lot and provides another excellent viewing venue. You can simply step out of your car and take a few steps to see these magnificent critters. NOW IS "PRIME TIME" "Prime Time" at the colony is from the middle of December until the first couple weeks of March. While viewing is excellent during this entire time, I tell folks the best time to go if you have school-age children is Martin Luther King holiday. Valentine's Day is another excellent time because it's very inspirational. 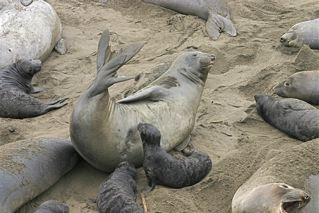 By that time many of the females have giving birth (one pup), nursed it for a month then goes into estrus. 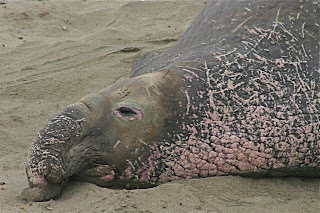 She will be mated with by one or more males before abandoning her pup on the beach to live on stored fat for a few weeks before teaching itself to swim. WATCH FOR ZEBRAS! So, plan a trip this winter. 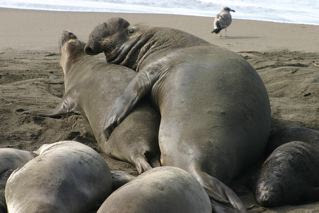 Stay in Cambria or San Simeon. Include a visit to the Hearst Castle, or at least the visitor center, where an IMAX format theater shows nature films and a docu-drama about the building of Hearst Castle. 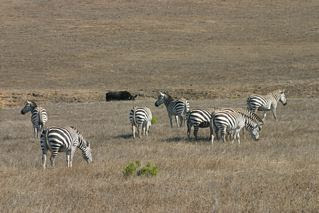 Be sure to be alert for the Zebra herd that roams the pastureland near Highway 1 around the Castle. 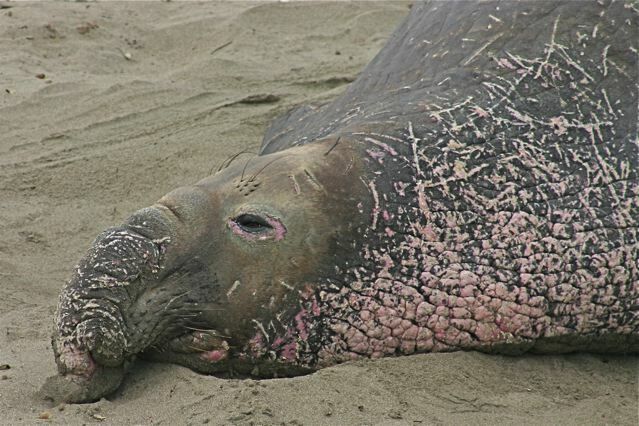 For more information you can visit the web site of the Friends of the Elephant Seal - the volunteer guides who staff the bluff to inform visitors - HERE. Take the trip - you'll be glad you did. 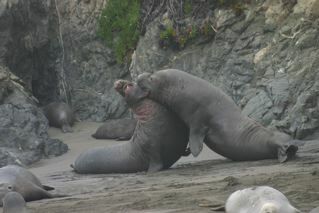 Here's a little taste of the action on the beach. The first big guy is trying to mate. He's chased away by a more dominant male. And, yes, some pups get crushed by this action.